Place mushrooms in a bowl. Pour over boiling water, cover and let soak for 30 minutes. Slice the mushrooms and discard the stems, reserving the liquid. Heat a wok over a medium heat. Add 1 tablespoon peanut oil. Stir-fry onion, snow peas and tofu for 2 min. Add garlic and cook a further minute. 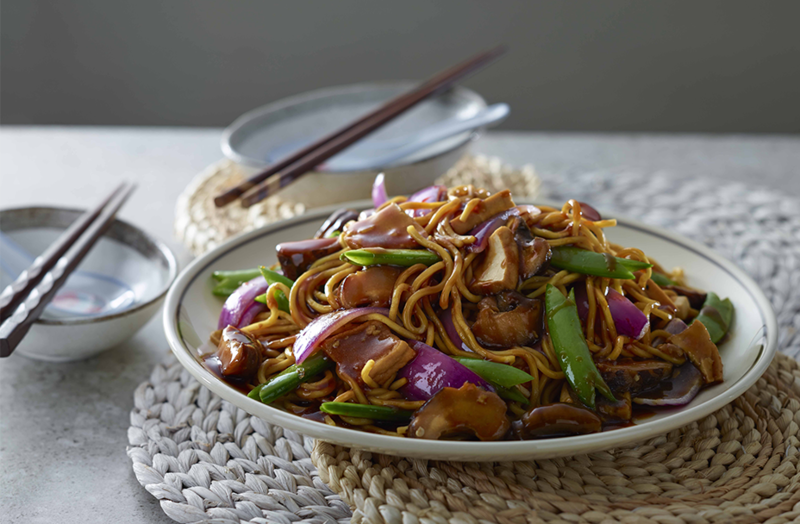 Add mushrooms and soaking liquid, Vegetarian Stir-fry Sauce and Sesame Oil to the wok. Stir until combined. Bring to the boil. Add prepared noodles, stir-fry until heated through. Garnish with chopped coriander and serve with lime wedges if desired.